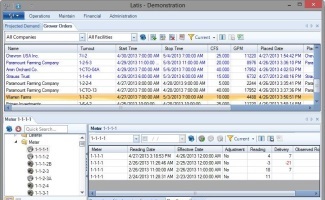 Latis is a comprehensive software application for water district management. It is built to assist water districts and other agencies with the management of their facilities, measurements, orders, and reporting. 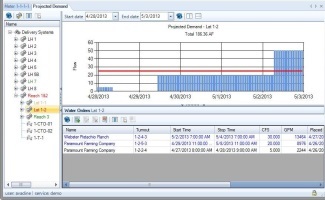 This includes meter readings and water usage analysis at each stage of the delivery system. 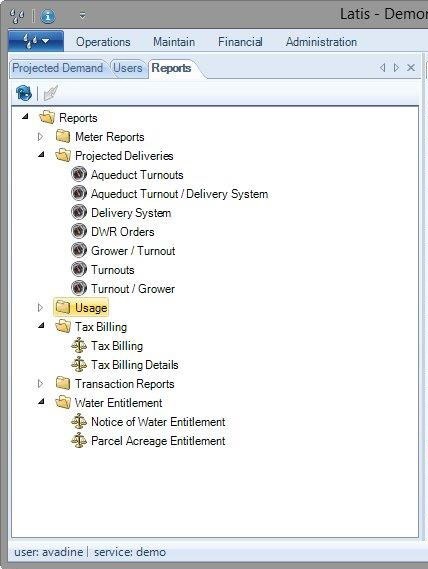 In addition, there are many reports in the application to calculate and display information about customer water usage, water deliveries, and facility status. All of the data for Latis is securely hosted online. There are no servers to buy and maintain. Customers only need to download and install a client application. 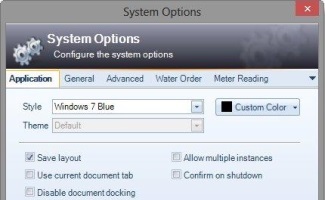 Any number of computers at a water district may download and install Latis. The client application is compatible with Windows 7, 8, and 10. 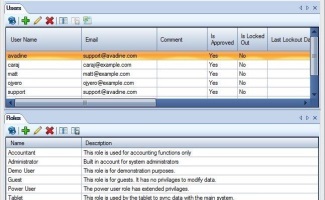 Additionally, Latis is configured specifically for each district, and can meet any custom modification or requirement. Contact us if you think Latis will work for you. 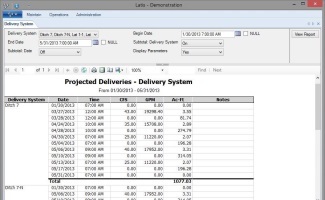 Latis allows you to see at a glance where water is flowing and identify any delivery capacity issues. 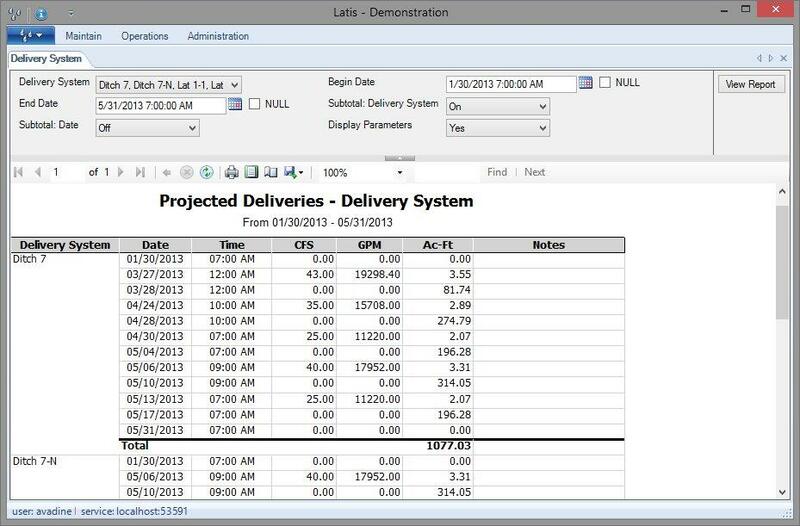 Any delivery system can be chosen to display sub-systems. 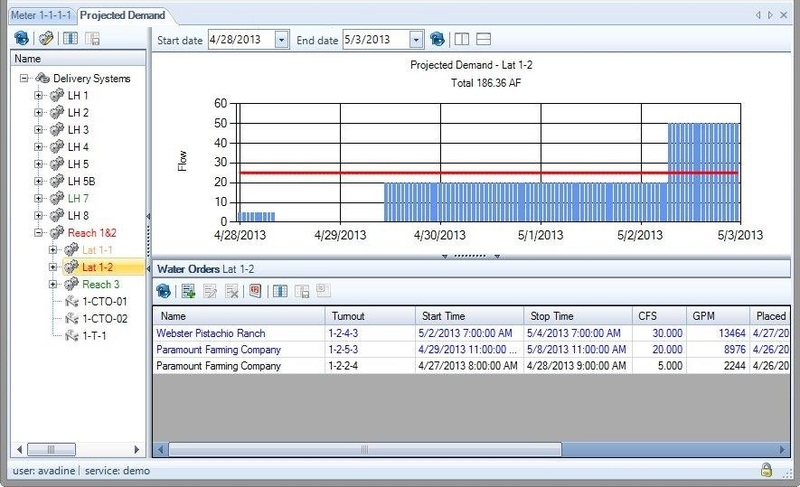 At each level you get a detailed graph of the flow over any time period, along with the water order details that make up the demand for water. 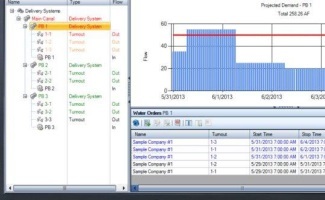 This allows you to identify delivery problems before they occur and take appropiate actions. 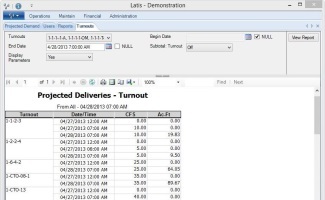 Latis allows you to configure your district's facilities. New types of facilities and measurements can be created by the user and will often include equipment such as turnouts, gates, laterals, and meters. Also, each facility has a list of properties and measurements that can be created by the user. This flexibility allows Latis to conform to any water district's needs. Companies that use water from your district may easily be added or removed from Latis. Different facilities, like meters, can then be associated with each company for easy tracking of how much water each company is using. 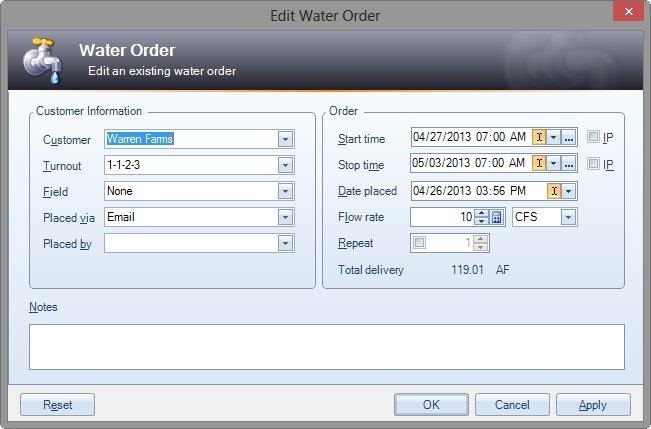 Entering water orders is made easy in Latis. 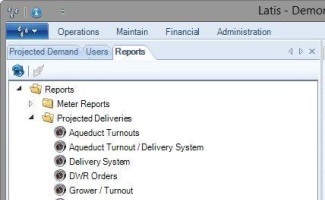 It is sophisticated enough to handle repeat orders and automatically include orders in the projected demand for each delivery system in your district. 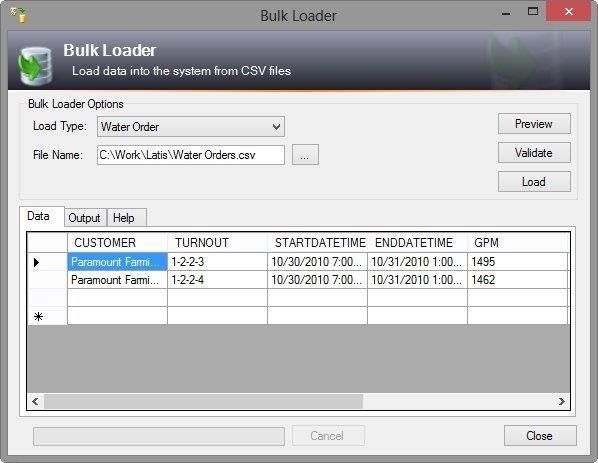 For customers that wish to automate the order process, Latis supports the ability to bulk load water orders. 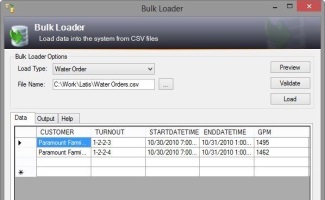 Your customers can send their orders in a simple text file that can be loaded into Latis for approval without the need to hand enter each order. 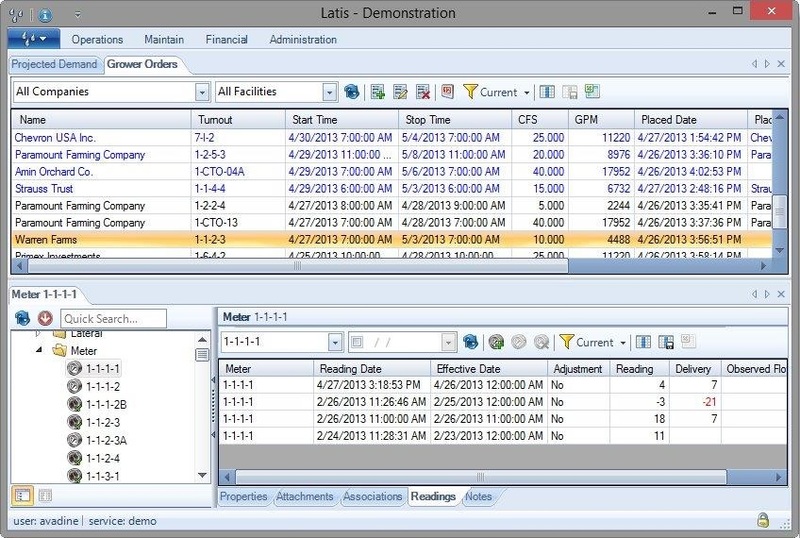 Latis includes a wide array of reports available for use. 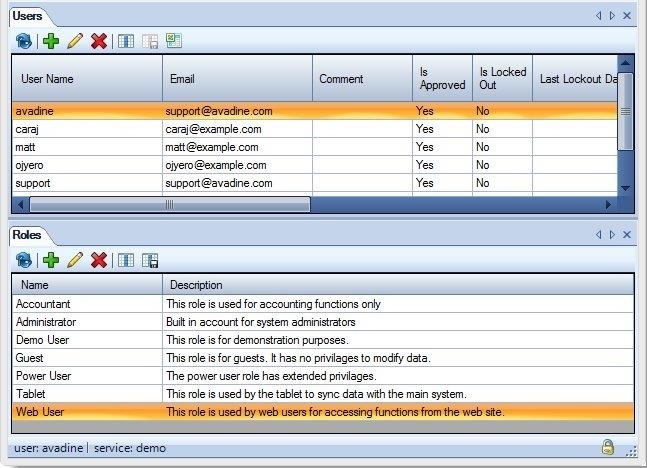 These reports are exportable to Microsoft Excel and are well formatted for printing. 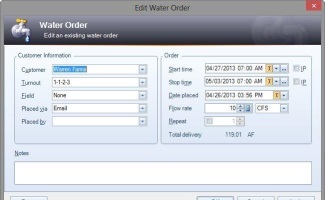 Your customers can order water through an online order web page. They can also access reports to give them details of the status of their account, orders, available water and any other customer information that you choose. 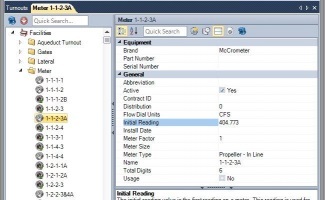 Using Apple iPads, your field operations personnel can gather water meter readings. 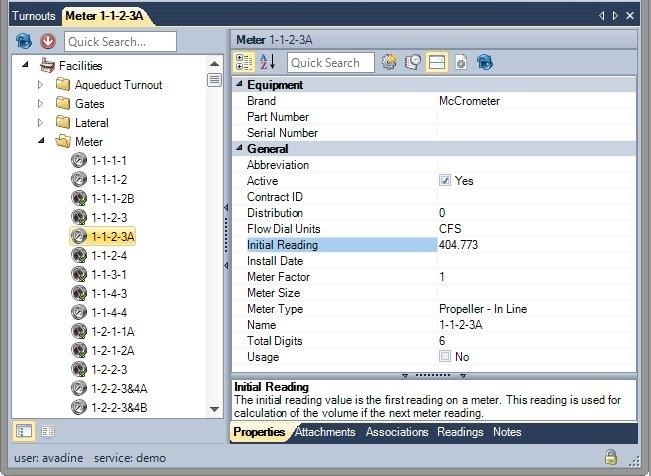 These readings can then be uploaded into Latis with the click of a button, eliminating the need to gather readings using paper and pencil. 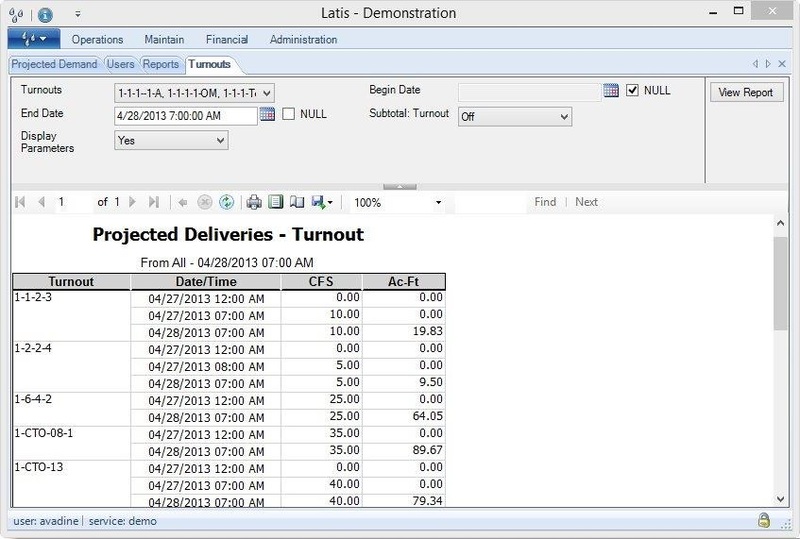 Latis is configured for each district and allows custom modifications to meet any special requirements. 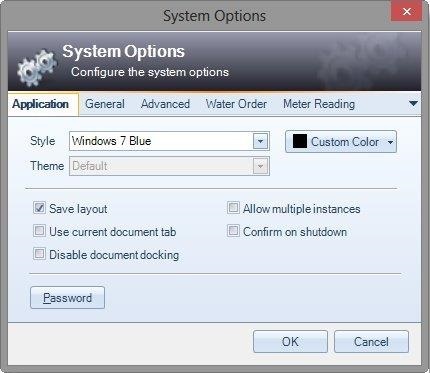 The program also allows you to configure it to your liking and needs. The look and feel of the appliction can be changed, and options for water orders and meter readings can be altered.